Found them surrounding the mushroom ring in the NW part of Tirisfal Glades. Randomly leveled 80-85. I was on my horde and they were friendly to me have no clue why they are there but they were added with 4.1. I really hope some sort of easter egg with these guys is discovered. I think they are too cool to be there for no reason. I think it's just another of those random places that they've added since Cata, that serve no purpose but perhaps a pretty place for some role playing. Like the resort at the southern edge of Feralas. They do something! At around 3 AM server time I happened to be standing around the mushroom circle with a few friends, when suddenly the darters gathered around and began singing! I've submitted the screenshot I managed to snap before they stopped. at 21:53 local, 00:53 server the dragons gathered and sang summoning a non clickable Faerie Circle. Families of Tirisfal Stag, Tirisfal Doe, and Trisfal Fawn gathered to watch. Then at 21:56 they scattered, the portal vanishing, the dragons fading out and the deer following after. Its 2 hours later and no dragons have returned. The circle can be /target ed, it has the usual 42 hp. at 03:50-03:52 local time 6:50-6:52 server time the event repeated. So every 6 hours perhaps? A friend and I just went there to check for these darters we had heard about and there they were, and soon after we came there they gathered and started this song. It was just amazing! I love that music, so beautiful! Submitted the screenshot my friend took. It started around 01:45 server time. Edit: Went there again today. First spawned around 17:00 server time but the event didn't start before around 18:10 or so. Frapsed it, video can be found here. Warcraft Less Traveled, a site that does a kind of travel log about the places in Warcraft, did a show on the event. Amazing, occured around 4:30am on FR-Kirin Tor. The faeries spawn smoothly, one by one, surrounding the mushroom's circle, begin to sing, and the other animals comes to listen and see that beautiful event with great music. You should invit some friends and surprised them with this ballad :). These things CAN have a heck of a long spawn timer. Arrived at the circle at 7:48PM server time, one darter was already up. Figured it wouldn't be too long for the event since people have said they spawn about ten minutes of each other. It's now twenty minutes later, and still only one darter. 8:09PM: Second one has just spawned. That puts them at over 20 minutes between darters (since I do not know how long the first one had been up before I arrived). 8:24PM and all darters were up. 8:59PM and the event commenced. Bloodhoof - US. Will be checking back in 6 hours to see if it happens again. 2:35AM and the event has commenced again. All sprites were up at 1:48AM when I arrived. That means that there was less than six hours between spawns, but still quite a long time. Just seen it at 1pm server time on Aman'Thul. There were 6 darters there when I got there, 7th spawned a while later. The deer started gathering a short time before it started so there is some warning on when it's about to begin. The song event happened around 12:50am, Eldre'Thalas-US, approximately one hour after the last dragon spawned. I also noticed the mushrooms in the area pulsing a glow that I didn't notice when I visited earlier in the day. It might not be something they do until nighttime though. The animals did arrive for me, but not until the dragons were all facing toward the center of the circle of mushrooms. Just caught them starting their show at 9:41am server time, on Cenarion Circle (US). Not sure when they started spawning, as I logged on around 8:45am and all seven had already spawned. What makes it even stranger is that they are in a place Blizzard had named the Whispering Forest. We all know Old Gods love their whispering. What is even stranger is that the fact that it is a forest makes it the perfect environment for the black goat that Caixa-enigma de Yogg-Saron was talking about. "There is a little lamb lost in dark woods." I think we all know what this means! Evidence points to that there is no Old God under that forest. Nope, none at all. These NPCs definitely aren't channeling some type of spell onto that dark patch of dirt to assist, seal, or harm something under the ground. It is just an easter egg. Nothing more. Nothing. 2:20 pm server time on Quel'dorei. Glad I looked up the NPC's here (all 7 were there when I came across them about 40 min before the event) otherwise I would have just kept on flying. at 8 AM server (Kilrogg US) i finally saw it! waited for a full hour after the 7 darters had spawned. they finally gathered, then started singing, then the deer approached. it was worth the wait! I FRAPSed the dance at 1pm server on US-Bonechewer. The fey had been around since at least 15 till noon. Also i noticed tonight while watching the event - the Stags that show up to watch are level 80, 81 and 82. I found it strange how the levels were different. *shrugs* its a strange strange place. This is by far, the best easter egg in the game no doubt! Has anyone noticed how the lake looks like a goat head on the map? Also, has anyone ever gone invisible in the place.... Maybe there is more than meets the eye about this place. . . .
My friend and I were exploring and merely came across this mushroom circle and there were Fey-Drunk Darters already spawned. Then the event started right when I googled about these NPCs. It was amazing. might be unrelated but at the bottom of the lake is a crashed plane. Another interesting aspect that supports the Shub-Niggurath theory is in a letter by Lovecraft to Willis Conover. 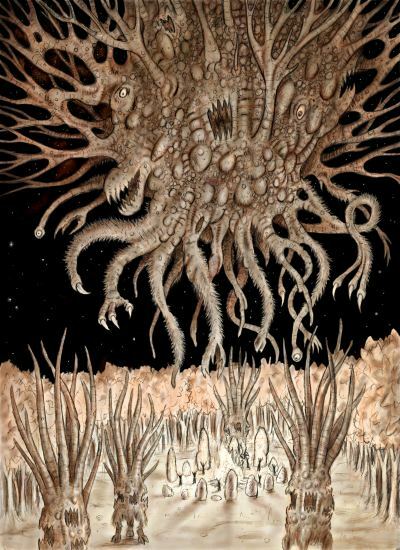 Shub-Niggurath is described in it as an 'evil cloud-like entity'. There is a wispy cloud that hangs over the circle in this zone continually. Whether the drakes are spawned or not. So it's one hour after the first spawn until the event starts. Seven Fey-Drunk Darters spawn around the mushroom circle, and for the longest time they just sort of mill around. I've waited for upwards of an hour, with all seven of them spawned, for them to perform the event, which, by the way, lasts for only a few seconds (at least, for me - every other comment I've read has said three minutes...) I was surprised at this. Such a long wait for a few seconds of channeling magic, although it was definitely worth it! I decided to view it from above, and one darter stood off to the side to channel while the rest formed a wagon-wheel shape. One didn't do it at all, leaving a "missing spoke". I wonder if it's like this for everyone? The wildlife appears plagued - they're all deer of some sort, although there is one white, scarred bear (which didn't watch the event) if you move farther southeast along that little opening in the mountains. There are bushes and trees with little red berries on them, although I feel as if this has little to do with the Old God speculations that have been floating around. Just saw this happen at 1:59 server time on Sen'jin. Was one of the coolest things I've ever seen on WoW! I also noticed that there was a crashed plane under the lake. This place is so awesome & mysterious! I am placing my bet that this will be a raid in future expansions, we saw what was added to the side of Black Rock Mt. Perhaps the old gods with rise from beneath the forest, who knows, perhaps what is going on in Scholomance and the Scarlet Monastery are leading up to something bigger. Me and my friend counted the number of black stags that are running around the forest the faerie circle is in. There are 7 of them. Possibly the "black goat with seven eyes"? Or just the "seven eyes". And as for the little lost lamb, we looked around for anything that could possibly be this "lamb", and found a white bear southeast of the circle. I asked a GM whether the Whispering Forest area, not just Tirisfal generally, was just a easter egg or if there was something actually important there. His response was "The contents of that area is a secret for now." which leads me to believe it is not, in fact, just an easter egg. On another note, it is possible to get here without flying from Tirisfal Glades. All you need is a level 40 speed mount, or some item/ability to make you run fast enough. You could try with a level 20 speed mount, but I haven't had any luck. Simply go to the Nightweb cave area in the Undead starting zone. On the left side of the mine roof, you can run onto the mountainside then run and jump onto the roof. Then you can run and jump back into the zone where the faerie circle is. EDIT: I successfully got up with just a level 20 mount and my friend did it without a mount, but it was much harder and he needed a perfect jump from the hill onto the mine roof and still barely made it, however it requires a different technique and is considerably more difficult, or you need to be lucky. Just go on the same hill to the left of the mine as said earlier, and keep running jumping until you bound up. It seems impossible, but if you do it enough and hit the correct angle/jump time, you'll suddenly bound up the hill. Then just climb to the highest hill and jump onto the red mine roof, and make your way back as usual! I'd just been in Undercity about three hours ago as my Worgen to see how far into the city I could sneak (answer: not very), and I figured, while I was in the area, I'd check out the circle to see if anything was happening. I got there around 5:45 AM (realm time), and was surprised to find all seven darters in place. I still had to wait about an hour before their ritual began, but it was so worth the wait. I've also flown over the island in the lake during the event, and been at the bottom of the lake, and nothing cool happens. I'd love to know what this is for. Someone quoted a GM as stating that it wasn't an Old God, but something else unsettling. Emerald Dream, anyone? It started at 06.30 am on Bronze Dragonflight, with the seven dragons having spawned before I got there at 05.50 or around that time. So I had 40 minutes of wait ahead of me. They fly away a little and then despawn straight away after the ritual, so if you come there and there are actually dragons around you're one lucky bugger whom may witness the ritual in a little bit. Don't be afraid of waiting though. When the dragons begin to sing, animals from the area starts to gather around to watch. http://us.battle.net/wow/en/forum/topic/6147175966 - general discussion of the event with lore and theories. http://rayneandiron.wordpress.com/2013/03/18/things-less-seen-the-whispering-forest/ - this blog alerted me of its existence, and I thought it deserved a little props. Should definitely have a look, it's a lot of cool stuff in there to discover! http://upload.wikimedia.org/wikipedia/commons/8/8f/Shub-Niggurath.jpg Picture of Shub-Niggurath, notice the circle of trees and stones :) Reminds me of the mushroom circle! There were other sites too, that I found information on, I will update when I find them. I was just checking the place and i noticed something strange x) There is crashed plane under water in the lake, fishing chair on the little island and skeleton with a sword shoved into its back. I just discovered this event watching a video on joystiq, so I hopped on my mount and headed there. By the time I got there at 6:30pm there were two Fey-Drunk Dragons spawned and the 7th and final one spawned at 7:02. The event started at 7:32pm and lasted around three minutes and the song lasted for about a minute after the fey dragons and forest animals retreated into the woods. As a great fan of the hidden easter eggs and mysteries in the game, this was great to watch. I recommend everyone go and check out for themselves! So according to a Blue's response to a few questions that were asked about The Whispering Forest and what is really going on there, they said this: " There's something incredibly unsettling there, but it’s not an Old God. It isn't recommended to go digging through the Glades, though." With that knowledge, any theories about Old Gods are debunked, and so I think it's safe to say that whatever entity is there is what causes the surrounding animals to look diseased and cursed (which would probably be even more accurate with an OG there), and that the Fey Dragons have their periodical ritual in order to keep this malevolence at bay. Considering that fey dragons only exist in The Dream, and places on Azeroth that are very close to it, along with the fact that they are practically the custodians of The Emerald Dream, i'd have to say that it is something from the Emerald Nightmare that they appeasing and keeping sealed in it's dimension with their hourly rituals. It must be VERY close to the barriers between our worlds due tot he fact that the Fey Dragons need to perform this ritual so frequently, and the fact that it's able to affect the surrounding animals, which might I mention, can only be found at The Whispering Forest. Also, an interesting piece of trivia is that Druids with the Glifo Calcinado, (a glyph that gives an extra ability which teleports Druids to set locations outdoors around Azeroth) have a set location in the center of that circle in The Whispering Forest. Since Druids and Fey Dragons have an intimate affinity with the Emerald Dream, it could suggest that creatures and people with such an affinity are drawn to that circle, willingly or unwillingly, which further connects The Whispering Forest to the Emerald Dream.﻿ Another tidbit of information, is that one of the reasons Faerie Dragons in lore are the caretakers of The Emerald Dream, is because they are immune to magic. With this in mind, it might be the reason why these Fey-Drunk Darters are the only animals in that forest which are not diseased or corrupted-looking, because whatever curse is on that forest is of magical nature. Since Faerie Dragons are also known in lore to police the Emerald Dream from magic, and that they can nullify it, it may insinuate that that's what they are there in the forest to do, and the beams they shoot that converge on the center of that circle are nullifying a creature of magical origin. This entity has connections to The Emerald Dream, due to people (Druids) and creatures who also share an affinity with The Dream ending up at that circle, whether it be intentional or not. The entity could possibly be what's causing disease and corruption in the animals living within the forest. The Emerald Nightmare is known to corrupt things. Faerie Dragons are immune to magic, and since the Fey-Drunk Darters are the only untainted creatures in the forest, it could mean that any corruption being spread is of magical nature. Faerie Dragons are known for their position as custodians of The Emerald Dream, as they police it from magic. This entity is close enough to our reality, and powerful enough to affect the animals, as well as being significant enough to cause frequent action among these Faerie Dragons, further suggesting magical and Emerald Dream origins, and probably dangerously so. Faerie Dragons are known to be able to absorb, redirect, and, most importantly, nullify magic. The beams being shot at the center could possibly be nullifying whatever magical entity is buried there. Conclusion: The Faerie Dragons are performing hourly rituals to nullify a great rift between our world and The Emerald Nightmare in order to keep an evil being of dark magic and corruption at bay. This being probably seeks the corruption of mortals and creatures that especially have a connection to the Emerald Dream, and is using their connection to bring them close enough to affect, which is why druids using Glyph of One With Nature may sometimes find themselves right in the center of that circle. The first of the fey dragons have started to gather. At first sight they seem peaceful while also projecting a certain playfulness as if they are inviting me to witness some ritualistic event. The dragons appear from the mist one by one as if ripping through the fabric of time. My presence does not seem to disturb nor frighten them in any way. On the contrary they seem to pay no attention to me as if I am but a lonely fly on a horse's back. I await in patience observing their every move. a deity wishes to communicate with me through the song of these majestic creatures. A nest has appeared through enchanting singing into the center of this elaborate mushroom circle, almost as if trapped, unable to escape from its enclosure even though its "jail" is comprised of such delicate structure. The majestic dragons have seized their enchanting song and yet...I can still hear their hypnotizing voices resonating within my mind. I can now see why these creatures are known as fey "drunk" darters as their song has left me in a complete absence of my inhibitions I am even having trouble climbing atop my trusted stead. The local fauna that amassed during the chanting have started to disperse. Oh My Gosh I just saw the Whispering forest ritual! It was awesome! Happened at 10:48 am. Two times in a row! And within 30 minutes too! At 23:03 server the ritual started and completed. I went afk for breakfast and when I came back at 23:18 there was the ritual lighting up my screen once again! So 15 min CD in between there. This might be a reference to the fairy ring in Quest for Glory 1. During the day, it's a ring of mushrooms. At night, it becomes a fairy ring, and tiny fairies dance over it. If the player enters the ring, the fairies ask him to dance. If he dances well enough, they give him some fairy dust. Alternatively, both game scenes were probably inspired by the Dance of the Sugar Plum Fairies section of Fantasia - https://www.youtube.com/watch?v=8At8zfh_o3E. Got to a dragonless circle just before 5:50pm servertime Khaz'goroth-US. By 5:50pm all 7 dragons spawned at once and the ritual started at 5:52pm. Over and done with after a minute. No long wait at all. Lucky? I decided to check this place after hearing about it today. When I arrived the fey-drunk darters weren't there yet but spawned soon after. A few minutes later the started doing their ritual which spawned Ninho de Dragoleta in the mushroom circle. Some quick facts are that the "Fey-Drunk Darters" are leveled 80-85 and faerie dragons such as these are known to be protectors of the Emerald Dream/Nightmare. They're immune to magic, and only appear in the Emerald Dream or places that are very close to it. The stags, doe, and the one bear are all leveled 80-85 as well. There are 7-8 stags with families that include fawn. All are diseased except the stags don't look so sickly. They all have green, glowing eyes. There is also a white bear that spawns and walks around southeast of the mushroom circle. This bear is sickly, but his eyes do not glow green. During the "ritual", "ceremony", etc. that these faerie dragons gather in formation and shoot beams of light towards the center of the circle. Music notes come from the faerie dragons and there is also a green, leafy aura. What's odd is they don't create a perfect circle. There are usually two of them that are off. Once, I've seen them so scattered and one of them wasn't even doing anything. Just sitting there staring like the animals around it. Animals from around the area gather to watch....all except the bear. This bear sleeps far from the circle and (may or may not be significant) WILL attack the stags if brought near each other. Killing anything inside or outside of the circle does nothing. I have not tried to let the bear kill all of the stags though. Soon. If too many stags are on the bear at once, he will die and nothing happens. On the lake to the north of this circle is a dead man with a sword in his back and fishing gear near him. At the bottom of the lake lies a plane crash with a small (possibly gnome) skeleton. There is also a chest which cannot be opened. Before Warlords of Draenor the time between rituals was very long and one was lucky to see it. After the expansion, the time decreased. Perhaps for the max level cosmetic item , but I have a different theory for why the time between was shortened. Possibly, whatever the Fey-Drunk Darters may be keeping at bay with their rituals is getting stronger as time passes. They have to do the ritual more, and more often to keep up with the strength of this thing. These aren't random animals either. Stags, a bear...these are closely related to druids. Druids can use to teleport them in the very center of this circle of mushrooms. The Emerald Nightmare is coming soon. Elune light your path! i was there for about 1,5hour and they have done the ritual 3 times now i alsow found that the wite bear disapers when they are doing the riutal. i found this on youtube. a orb killing deers random? They just spawned and sang twice within 20-30 minutes for me. It seems that the timing is completely random. The event is on about a fifteen minute spawn timer now. The music is beautiful, the event lasts about three minutes. The chest is in the northernmost part of the lake ... from plane to log with skeleton ball-and-chain, to the chest ... it is not interactable. The stags are not plagued, at least there is no sign of decay on their bodies ... only the does and fawns seem afflicted. This area was reachable through rock climbing before Cata, and there was a ring, but not like now. The ring has larger mushrooms which are white and pulse a green light. There is a thin, dark cloud that hangs over the ring, just above head level, when the darters are not present. The wildlife remains in forest after the event ends. This occurred around 08:30pm server time ... it may still have been "daytime." I went into the Whispering Forest to get Rolo de Música: Dragoleta at around 19:20 (Server Time) to find the Plati-fada had already spawned in around the mushroom circle. At 19:25 (server) the dragons formed a circle and began their song, spawning a Ninho de Dragoleta in the centre of the mushroom circle, where I was able to loot and learn the music roll. The song lasted for about 5 minutes ending at 19:30 (server), the diseased animals of the forest gathered round, onlooking the song, and also dispersed once it ended. Ugh I just wish I knew what is going on in that place! By the lake there are some Twilight Hammer cultists. There is the skeleton with a sword through his chest. And weirdly rats in the water not far from the fisherman. And all of them are facing the same direction. If you swim in that direction the lake will get a bit deeper. Slightly to the left you'll see a sunken plane. And to the right a flat disc, which almost looks like it is blocking something. Is it just me that think that the lake (once you're under the surface), looks a bit like a crater? While logged onto my Blood Elf Demon Hunter, I flew into the Whispering Woods out of pure curiosity. The layout was mildly altered from Cataclysm. As someone has commented earlier, it looks does look like a crater to me, but the mini-map also makes it suspiciously resemble an eye. I noticed that the Twilight Hammer mobs were level 99, but I was able to kill them with minimal effort. I decided to inspect the disc beneath the water a bit more. Not only did it change my location from "Whispering Forest" to "Underwater Passage", the music also changed. I also noticed that the disc isn't a flat disc on both sides so much as a screw of gargantuan proportions. And it seems to be screwed into the ground, blocking entrance into the Underwater Passage. I have a couple of suspicions as to what the disc, and Underground Passage, may be tied to, but we won't really know the answer until some time after Legion's launch. Assuming that there will even be an answer at all. But I'm hoping that there will be! Sadly, the dragon nest never spawned for all three of the times that I had observed the fey-drunk darters perform their ritual. In a strange sense of irony both theories about this area are confirmed for Legion. Beneath the forest lies the tomb of the Titanic Watcher Tyr and the servant of the Old Gods who killed him. Which one the Fairy Dragons congregate around is currently unknown. Not sure if there's been any change in respawn time or if I was simply lucky, but when I arrived, there was no darters spawned. I roamed the area for a bit and returned within 5 minutes, and all 7 had already spawned and were milling around the area. None responded to a /sing emote. But 4 minutes later, they began the ritual and the dragon's nest spawned. Might be a stretch, but anyone think that the plane in the water could be a Hatchet reference? Make sure you revert time in a post-Battle for Lordaeron world, as they don't seem to appear in the "current" tirisfal glades after 30+ minutes. дракончиков, как и эвента нет в новой версии Тирисфальских лесов, которая появилась после осады Подгорода. Нужно переходить в "старую версию" через баф "Путешествие во времени". На карте - облачко с нпц Зидорми у усадьбы Балнира. Esse PNJ pode ser encontrado em Clareiras de Tirisfal (6).